of singly occupied orbitals, an unfavorable electronic arrangement. and lowest ones, which are unique. On the basis of Hückel\u2019s rule, label the following molecules as aromatic or antiaromatic. Figure 14-17) azulene; (e) S-indacene. In Summary Cyclic conjugated polyenes are aromatic if their p electron count is 4n 1 2.
nonplanarity, cyclic polyenes behave as nonaromatic alkenes. Hückel\u2019s rule also applies to charged molecules, as long as cyclic delocalization can occur. structures. 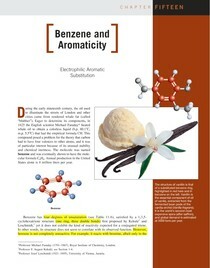 This section shows how charged aromatic systems can be prepared. effect of the negative charge. at low temperature and is extremely reactive. pared with that of cyclopentadiene. by a factor of 1014. Explain. On the basis of Hückel\u2019s rule, label the following molecules aromatic or antiaromatic. (a) Cyclopropenyl cation; (b) cyclononatetraenyl anion; (c) cycloundecapentaenyl anion. and obey the 4n 1 2 rule. Azulene (see Exercise 15-16d) is readily attacked by electrophiles at C1, by nucleophiles at C4. Explain. tures might then provide the answer. Attack by E1 at C1 generates a fused, aromatic cycloheptatrienyl cation framework.